This coupon makes them ONLY $.50 a box! Woohoo!!!!! 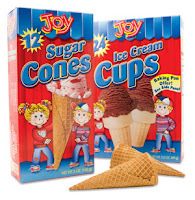 The 12-count Joy Ice Cream cones on Rollback $1, making them ONLY $.50 after coupon~ Ice cream is one of our favorite summer treats! Our kids LOVE the multi-color cones! For more of the latest steals and greatest steals, stay tuned to The Coupon Centsation.